All of the rings in this section were made in the classical, pre-drawplate method. The metal is beaten into sheet or bar, and sheared to the desired sizes. Round shanks and wires are made by twisting the bar and then rolling it between smooth blocks to round the corners. The beaded sections are done by rolling the metal on a wooden block under a sort of swedge tool. Perforations in the metal are done by punching with a small drift and hammering the outer profile. These rings, made of fine silver and 18K gold, are set not with solid stones, but with beads made by drilling gemstones. These are run through with wire threaded through holes punched in the shoulders of the rings, and bound about the shanks. In many cases the beads spin freely on the top of the rings. The ring on the left is composed of three strips of beaded wire with granules and a plate engraved with “VIVAS”, a common inscription on Roman rings. The ring at center is composed of three strips of beaded wire with granules and a plate engraved with “VIVAS”, a common inscription on Roman rings. The ring at the right is based on some of the finger rings in the Thetford find, a hoard from around 350 CE. It is set with a carnelian. In Classical times most clothing was not buttoned or leaced, but simply pinned closed. In fact many garments were tubes or sheets of fabric, wrapped, folded, and pinned in place. These elegant little brooches were very popular in ancient times. Some were made with an integral spring and pin, as with the one pictured at right, while others had attached pins. More pins will be added here soon. These earrings are based on a pair on display at the National Museum of Ireland, and were made using copies of bronze tools found in Co. Kildare. 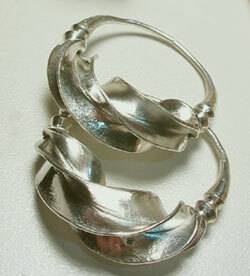 They are forged from a single ingot, that is formed using bronze punches anvils and chisels. The tools and this sort of flanged metalwork date from the period from 1200 – 1000 BCE. I will be writing more on this topic soon on another page on this site. 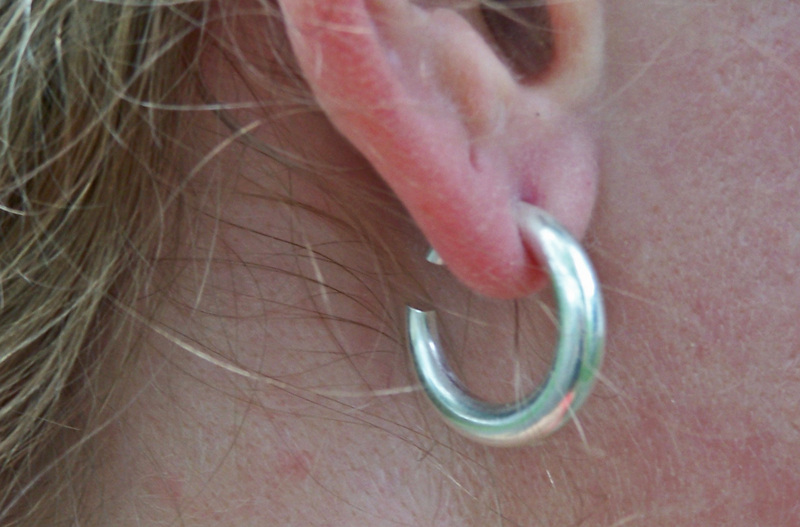 We don’t really know from the archaeology if these were worn in the ear, or perhaps in some other piercing. Many of these objects have been discovered in Ireland and the UK, and most are gold, with a few being gold with silver inlay. Early collectors called them “Ring Money” though there is no evidence for their use as currency. They occur in a variety of sizes, but are always of a round cross section bar that tapers evenly to both ends. Their surfaces are smooth, and the ends have been worked so that they are parallel to one another. I made this one by forging a silver bar in a bronze swage block with a small stone hammer, and then rolling it against an abrasive stone with water to smooth the surfaces. I then bent it into a circular shape, and stoned the ends smooth and parallel. The earrings on the left are based on examples from Imperial Rome. Those on the right are based on some from the Black Sea Basin from 4th Century BCE. Ribbon torcs are some of the most enigmatic and beautiful objects of the Iron Age. Until recently the process for making them was lost: They are not simply a twisted strip, but have been worked so that a ribbon of metal becomes much shorter along its center-line, while the edges remain long. Extant examples tend to be small and fragmentary, and the bulk of “complete” torcs, have been put together from fragments that may or may not have been parts of the same initial work. A few complete examples do survive, and they are stunning in both their concept and execution. These experimental torcs are made of fine silver, but all the surviving ribbon torcs are made of gold that is very close to 18K and has a high silver and low copper content. For most of the 20th century it was believed that ribbon torcs dated from the early Bronze Age, because a hoard was discovered in the late 19th century, that contained many torc fragments, and a small piece of very thin gold sheet. Close examination of both the sheet and the fragments makes it clear that both are Iron Age, both in alloy and in working techniques. I will be writing more on this topic soon on another page on this site. These arrow points and knocks are cast of tin bronze. They are size of the original models, a little smaller than modern points. 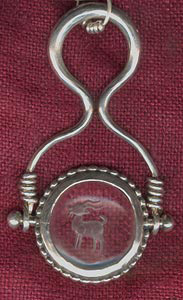 This rock crystal intaglio seal is of the sort used in antiquity. It is set in Sterling silver with a tapered hourglass hanger, on which the seal pivots for use. The whole assemblage measures about 40mm in width by about 70mm high. If you have questions about any of my work, or want more details about any of the things you see here do not hesitate to contact me.